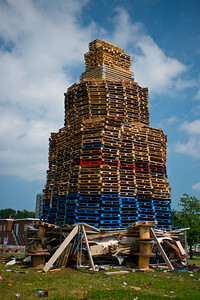 Protestant bonfire in the loyalist Milltown area of East Belfast, built as part of the annual Battle of the Boyne celebrations on the 12th of July. 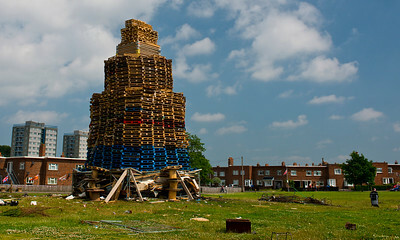 Protestant bonfire in the loyalist Milltown area of East Belfast. 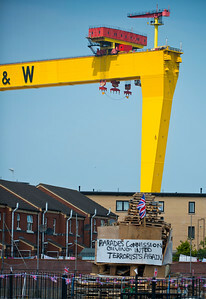 A Real Estate agent has taken the opportunity to advertise a nearby development, on a protestant bonfire in Belfast. 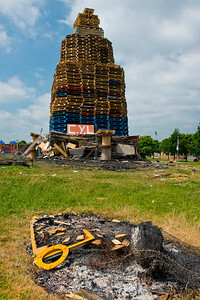 Protestant bonfire in the loyalist Milltown area of East Belfast, built as part of the annual Battle of the Boyne celebrations on the 12th of July. A Real Estate agent has taken the opportunity to advertise a nearby development. 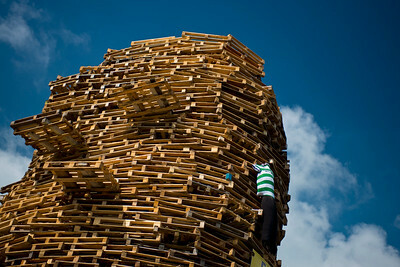 An effigy of a Celtic football fan ready to burn on a protestant bonfire in Belfast. 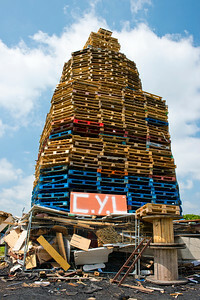 The top of a protestant bonfire in the loyalist Milltown area of East Belfast, built as part of the annual Battle of the Boyne celebrations on the 12th of July. 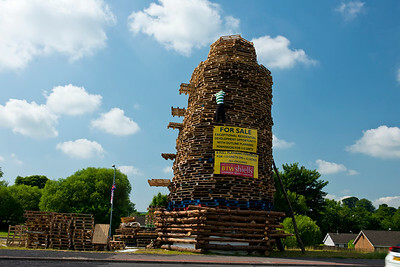 This one also features an effigy Celtic football fan to be burnt as well. 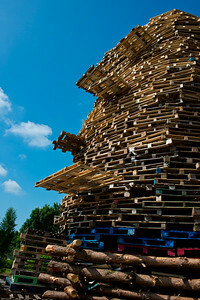 Close up view of a huge protestant bonfire in the loyalist Milltown area of East Belfast. 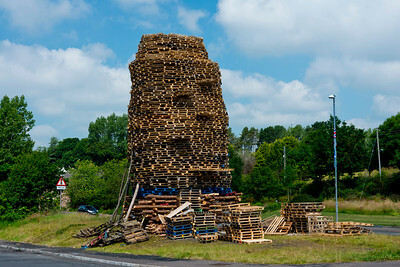 Close up view of a huge protestant bonfire in the loyalist Milltown area of East Belfast, built as part of the annual Battle of the Boyne celebrations on the 12th of July. 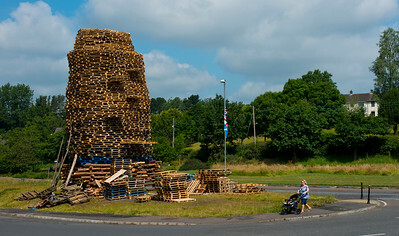 A woman walks past a massive protestant bonfire in the loyalist Milltown area of East Belfast, built as part of the annual Battle of the Boyne celebrations on the 12th of July. 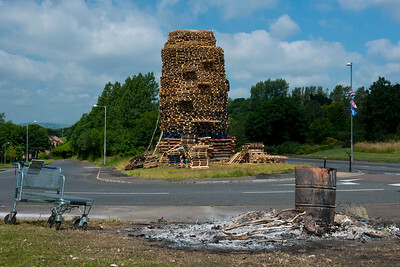 A roadside protestant bonfire in the loyalist Cluan Place area of East Belfast. 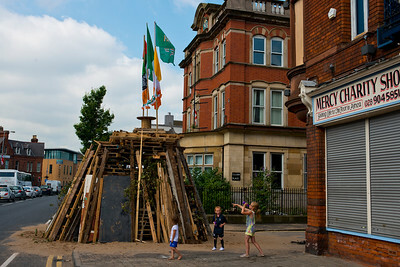 Children play around a protestant bonfire in the loyalist Cluan Place area of East Belfast. 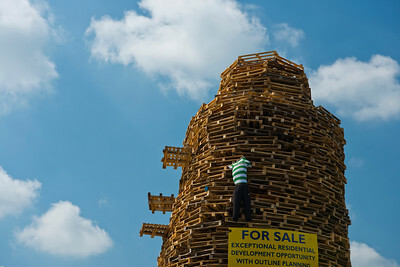 A young lad looks to climb up a protestant bonfire in East Belfast. 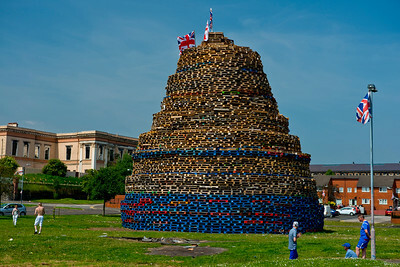 A massive protestant bonfire in the middle of an housing estate in the Castlereagh area of East Belfast. 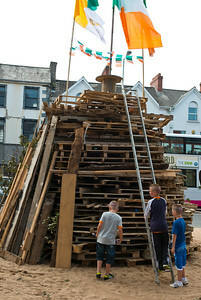 Young lads play around a protestant bonfire in the loyalist Cluan Place area of East Belfast. 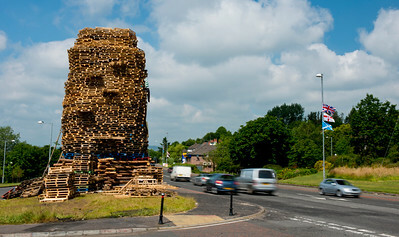 A massive protestant bonfire in the Castlereagh area of East Belfast. 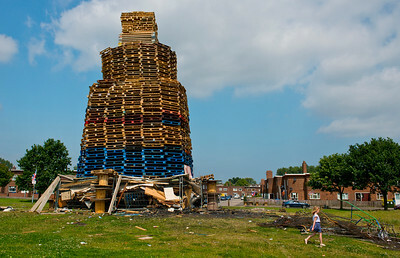 A young girl skips past a massive protestant bonfire in the Castlereagh area of East Belfast. A loyalist protest against the Northern Ireland parades commision. 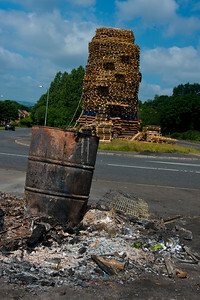 A loyalist protest against the Northern Ireland parades commision on a bonfire in the Newtonards Rd Aerea of East Belfast. 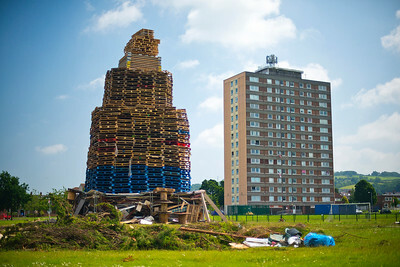 A massive protestant bonfire in the middle of an housing estate seems to dwarfe a nearby tower block in East Belfast. 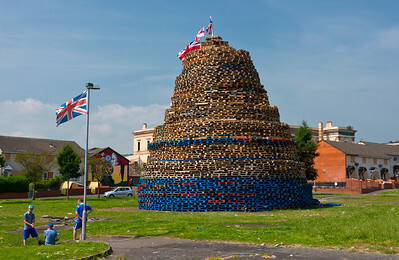 A massive protestant bonfire in the middle of an housing estate seems to dwarfe a nearby tower block, in the Castlereagh area of East Belfast. 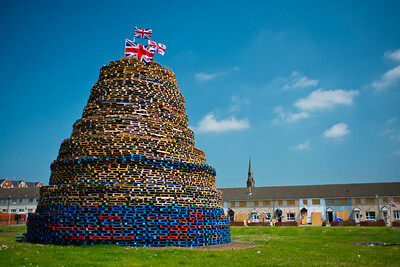 Protestant bonfire in Hopewell Square, part of the loyalist Shankill area of West Belfast. The houses in the background are boarded up to protect against the heat. 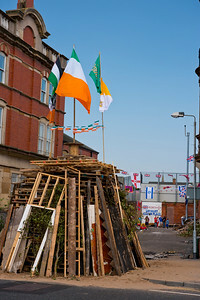 Protestant bonfire in Hopewell Square, part of the loyalist Shankill area of West Belfast, with the Crumlin Rd courthouse in the background. 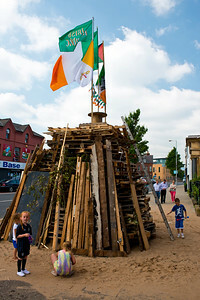 Protestant bonfire in Hopewell Square, part of the loyalist Shankill area of West Belfast. 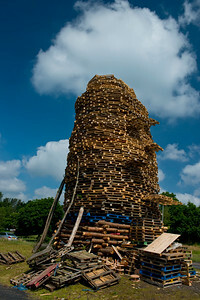 The bonfires are built as part of the annual Battle of the Boyne celebrations on the 12th of July. 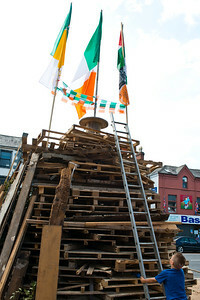 Protestant bonfire in Hopewell Square, part of the loyalist Shankill area of West Belfast. 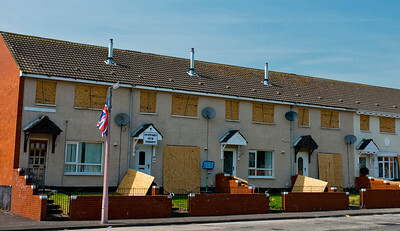 Houses facing the protestant bonfire on Hopewell Square in loyalist Belfast, are boarded up to protect against the heat. 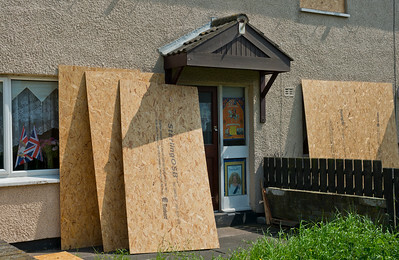 Houses facing the protestant bonfire on Hopewell Square in loyalist Belfast, are prepared to be boarded up to protect against the heat.